The spatial distribution of new beams generated above the threshold of absolute instability of two counterpropagating incoherent light waves is studied and compared with the results of calculation. R. Rebhi, P. Mathey, H. R. Jauslin, G. Cook, D. Evans, and S. Odoulov, “Four-wave-mixing coherent oscillator with frequency shifted feedback and misaligned pump waves,” Opt. Lett. 34, 377–379 (2009). R. Rebhi, P. Mathey, H. R. Jauslin, G. Cook, D. Evans, D. Rytz, and S. Odoulov, “Dynamics of four-wave-mixing oscillators with quasi-phase-matching,” Phys. Rev. A 7280, 013803 (2009). 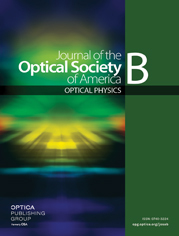 D. R. Evans, G. Cook, J. L. Carns, M. A. Saleh, S. A. Basun, J. M. Seim, and G. J. Mizell, “Major improvements in the photorefractive and photovoltaic properties in potassium niobate,” Opt. Lett. 31, 89–91 (2006). C. Denz, J. Goltz, and T. Tschudi, “Enhanced four-wave mixing in photorefractive BaTiO3 by use of tilted pump waves,” Opt. Commun. 72, 129–134 (1989). N. V. Kukhtarev, T. I. Semenets, K. H. Ringhofer, and G. Tomberger, “Phase conjugation by reflection gratings in electrooptic crystals,” Appl. Phys. B: Lasers Opt. 41, 259–263 (1986). R. Rebhi, P. Mathey, H. R. Jauslin, and B. Sturman, “Strong lowering of the mirrorless optical oscillation threshold by angular mismatches for nonlocal photorefractive nonlinearity,” Opt. Lett. 33, 2773–2775 (2008). A. Yariv and D. Pepper, “Amplified reflection, phase conjugation, and oscillation in degenerate four-wave mixing,” Opt. Lett. 1, 16–18 (1977). D. R. Evans, G. Cook, and M. A. Saleh, “Recent advances in photorefractive two-beam coupling,” Opt. Mater. 31, 1059–1060 (2009). B. Sturman, S. G. Odoulov, and M. Y. Goul’kov, “Parametric four-wave processes in photorefractive crystals,” Phys. Rep. 275, 197–254 (1996). P. Mathey, M. Grapinet, H. R. Jauslin, B. Sturman, D. Rytz, and S. Odoulov, “Threshold behavior of semi-linear photorefractive oscillator,” Eur. Phys. J. D 39, 445–451 (2006). Fig. 1 Schematic representation of the experimental arrangement. Pump waves 1 and 2 enter the photorefractive crystal (PRC) from opposite faces. The lenses L 1 and L 2 with focal lengths F form a symmetric telescope that projects the image of a mirror M into the photorefractive sample PRC. The misalignment of the pump waves is adjusted by the tilt of the mirror M. Pump wave 2 enters the sample through a small aperture in the screen SC, which is used for monitoring the angular positions of pump wave 1 ( θ ) and oscillation waves 3 ( ϕ 1 ) and 3 ′ ( ϕ 2 ) , with δ being the angle between pump wave 1 and oscillation waves 3 and 3 ′ . All waves are polarized in the plane of the drawing, e being the polarization unit vector. Fig. 2 Far-field oscillation patterns of crystal A. Two pump waves are (A) misaligned to 3 mrad in the horizontal plane, (B) misaligned to 5 mrad in a plane tilted to ≈ 30 ° with respect to the horizontal plane, and (C) aligned nearly perfectly. Pump ratio r = 5 . Total change of angle within frames A and B is 250 mrad , while within frame C it is 400 mrad . Fig. 3 (a) Temporal variation of the mirrorless oscillation intensity (curve 1) in crystal A with slowly varying intensity of the pump 1 (curve 2). An abrupt disappearance and reappearance of the oscillation intensity prove the existence of the oscillation threshold in pump ratio. (b) Dependence of mirrorless oscillation intensity on the pump ratio, reconstructed from Fig. 3a. Fig. 4 Dependence of the oscillation wave angle on pump misalignment angle for crystal B. The solid lines represent the best fit of the calculated dependence to the measured data shown by the vertical bars. Fig. 5 Ewald sphere constructions for phase-matching diagrams. All the wave vectors k i have the same modulus k = 2 π n ∕ λ . Grating vectors K 1 , 2 are parallel and differ by Δ in their length. Inside the sample the pump wave misalignment angle is θ ¯ and the tilt angle of the oscillation wave with respect to the co-propagating pump wave is δ ¯ . Fig. 6 Calculated phase-mismatch dependences of (a) the threshold coupling strength and (b) the threshold frequency shift for mirorrless oscillation with the pump ratio close to optimum, r = 5 . Fig. 7 Calculated pump ratio dependences of (a) the threshold phase mismatch and (b) the threshold frequency shift for mirorrless oscillation with γ l = 4 . (6) τ ∂ ν ∂ t + ν = γ * I 0 [ A 1 * A 4 exp ( i Δ z 2 ) + A 2 A 3 * exp ( − i Δ z 2 ) ] . (7) ( k 1 − k 2 ) − ( k 3 − k 4 ) = Δ .